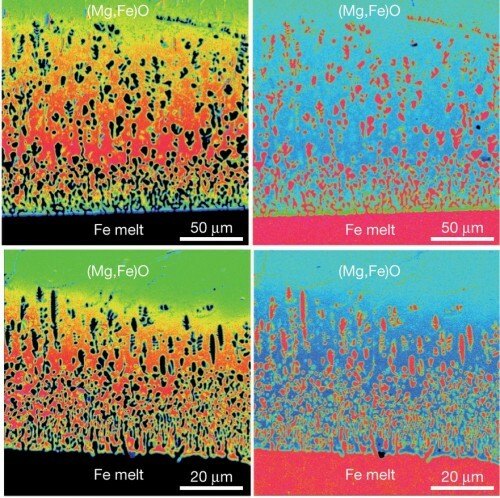 Mapping of magnesium concentration (left panels) and iron concentration (right panels) in molten iron and a solid oxide at 2,123 K for 60 s (bottom panels, run number K1234), and in molten Fe and a solid oxide at 2,123 K for 300 s (top panels, run number K1237). In left panels, red corresponds to high magnesium concentration and green corresponds to low magnesium concentration. In right panels, red corresponds to high iron concentration and blue corresponds to low Fe concentration. Courtesy of Shun-ichiro Karato. Recent discoveries by Yale researchers could offer insight into the makeup of the Earth’s deep interior. The research, published online December 2012 in the journal Nature, suggests the penetration of iron from the Earth’s core to the mantle (the rocky layer below the surface crust) to a degree much further than previously thought. “According to our experimental studies, we predict that iron could penetrate to the mantle to at least tens of kilometers,” said Shun-ichiro Karato, Yale Professor of Geology and Geophysics and the principal investigator of the study. A cross-sectional view of the Earth, with the metallic, iron-rich core at the center, the convecting mantle (shown in purple) in the middle layer, and the surface crust. Courtesy of the Yale Geology & Geophysics Department. The Earth has a radius of about 6,400 kilometers, and by volume is made up mostly of the rocky, 3,000-kilometer-deep mantle and the dense, metallic, iron-rich core. However, these layers are not homogenous, and heterogeneities in the bottom of the mantle result in low velocities of the seismic waves produced by earthquakes. “One way to explain low velocity is to assume some core materials penetrate into the mantle. Materials in the core are mostly iron, and if iron is added to the mantle, which has a small amount of iron, then seismic wave velocities should be lower,” said Karato. 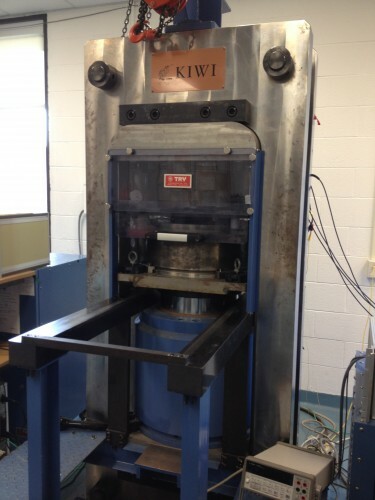 A compression machine in Dr. Karato’s lab which bring samples to high pressure and temperature to simulate conditions in the Earth’s interior. Courtesy of Shun-ichiro Karato. In the past, the challenge has been to find out how this penetration can happen. “One well-known mechanism is called diffusion, when iron atoms slowly penetrate into the mantle one by one,” said Kataro. But measured diffusion penetration depth is about 100 meters to one kilometer, which is too small to explain low velocity, since low velocity requires tens of kilometers of penetration. Karato explained that during his Ph.D. study, the paper’s lead author, Kazuhiko Otsuka, “was conducting experiments where he put a tiny (~one millimeter cube) sample surrounded by a metallic capsule.” He found that in one sample, the capsule was unexpectedly melted. At first, the team thought that the sample had failed, but they soon realized that the molten metal had actually penetrated much faster and deeper than expected. “I expected penetration by, say, 5–10 microns, but in this case the penetration was 1 millimeter. I said, ‘this is not a failed experiment — this is a fantastic discovery,’” Karato said. Diagram of convection in the mantle. Convection moves material from the deep interior closer to the surface of the Earth. Courtesy of ThinkQuest. After systematic work, they established that this phenomenon had not just happened by accident. As a result, the researchers concluded that the core and mantle can interact more extensively than previously thought. “Classical mechanisms predict only 100 meters or one kilometer [of interaction]. But if the core materials could penetrate to 50 kilometers or even 100 kilometers, then, because the mantle is convecting — material is circulating — deep materials from the core have an opportunity to be transported, even to the surface,” said Karato. Dr. Shun-ichiro Karato, Yale Professor of Geology & Geophysics. Courtesy of the Yale Geology & Geophysics Department. The consequences of these findings could even extend beyond Earth. “There is an enigmatic observation about the planet Mercury: In between its mantle and core, there must be some dense material that they don’t know how to explain,” Karato said. He is currently studying this material, the presence of which might be explained by the same mechanism as in the Earth.